Our teacher, Mr Lovett gave the photograph to us as a Christmas card in 1957. For those who do not already know unfortunately Frances died of cancer when she was only 29 and Peter died at age 51 also of cancer. Can anyone identify the remaining two missing names? If you can, please leave a comment below. 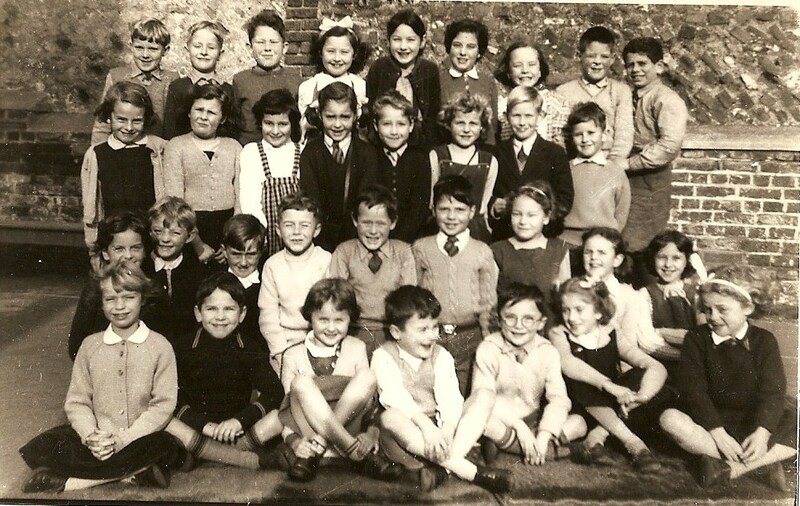 Only to add my name to be associated with the above class which I joined the year after from Davidor Road Infants… I stayed in the class until 11-plus and left it in July 1961. Sadly Penelope Hallett and Peter Ansell also died at an early age. I remember that Peter Ansell and also myself won the inter-school championship cups for swimming when we were about 11. Also Lynn Hallett died in her early thirties. Hey that’s my big brother in the front row second from left. Still has the same grin and still in Hove. Ian was the year above me. Does anyone remember Mr Lawrence who would cane anyone at the drop of a hat? He did me. I, like Tony Hagon above (who I may have known at the time! ), left Davigdor Road Infants and joined Goldstone in 1958. It’s strange how I remember most of my classmates at Hove Manor School for Boys which I joined in 1962, but barely remember anyone at Goldstone although now I’ve seen the names above a few do ring a bell. Peter Ansell, Libby Morris, Linda Lenton and Anthony Carr, although they would have been in the year above me. Two of my mates Peter Vincent and Tony Bennett may have gone there too. Although I joined Class 3C in April 1960, moving to 4B until summer 1961 when I went on to Hove College, I recognise most of these names. Recently have connected with Barbara Lank. Amazing the transfer of time, how we were all in short trousers then, and are now approaching our pensions. Since then there have been some significant events. The Beatles were just starting, Marilyn Monroe always to be remembered as she was not as she may have become, rockets in space, man on the moon, Kennedy assassination, Vietnam escalation, Martin Luther King, Cuban missile crisis, the IT age, the E type Jag, trouble in Ireland, Aden independence and a bloody one (my Dad was there), mass immigration, the Berlin wall and its coming down, Falklands and wars in the Middle East, plus the Mini – car and skirt, Flower Power, plus loads more. We have lived through some historic times, and sad to see a few of our old friends did not make it, may they RIP. Over 4 years since this photo was posted but we now only have one missing name! Dave Standing has just informed me that the boy in the third row on his left is John Gilkes. So can anyone identify the girl in the back row between Jean and Lesley to complete the list of names? Hi Nick, I went to school with your sister Janet. I remember the Luckhurst family well and now reside in Canada. Talk about a blast from the past. Hi Lindsay. I spoke to Ian a few years ago after posting this photo and have caught up with a couple of others. As we are all getting older I believe we reminisce more about our childhood and certainly I have happy memories of Goldstone Junior. Janet and I still live in Sussex only 5 minutes away from each other and she sends you her best wishes. How long ago did you move to Canada? Hi Nick. That’s awesome that you and Janet live near each other. Just looking at the pics I wonder where the time has gone. I moved to Canada in 1974 and am married with two lovely daughters. One is married and am hoping for a grandchild soon. The older one is married to her job and travels all over the world. I married a Croatian man and we have recently moved from the city, Toronto, up north into the country to a nice bungalow. I am still working part time and enjoy it. Hope all is good for you. I remember your parents especially your dad tanning on Hove beach. He was always so fit and just wore heavy sweaters in the winter. Funny the things you remember. Take care.